Too often, performance laptops are associated with some sort of compromise. Squeezing high-end components inside a package small enough to be considered legitimately portable is difficult. A desire to keep thing as slim as possible often means ports are sacrificed to shave off bulk wherever possible. Controlling heat and power consumption within a compact chassis is another challenge. Usually, your choice is either a professional laptop built for content creation or a gaming laptop designed specifically for play. Even then, you face trade-offs. The former usually do well in terms of size, but they aren’t really meant for gaming. Most make do with integrated graphics, and solutions with discrete GPUs are usually focused on providing a modicum of extra power for creative applications. While we love us some ominous black with glowing red accents (clearly), gaming laptops don’t exactly blend in at the office or in a classroom, and they’re more likely to prioritize cooling and performance over portability and battery life. Enter the ZenBook Pro, a laptop built for performance and designed to go wherever you go, with no compromises on size, power, weight, connectivity, or design. Measuring just 18.9 mm thick and weighing only 3.97 lbs, the ZenBook Pro rivals ultrabooks in form factor. 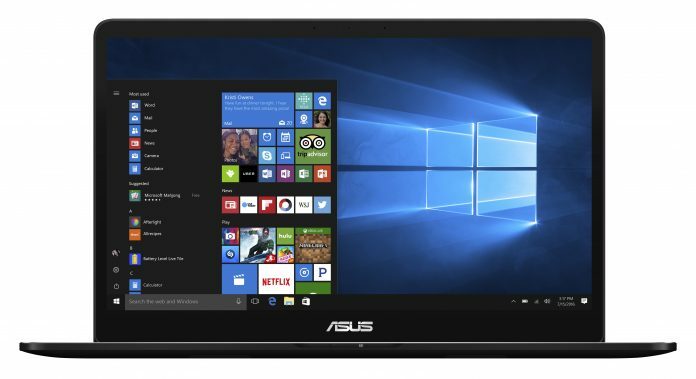 Its all-metal, unibody construction is accented by an illuminated ASUS logo atop the lid, and the diamond-cut silver accents along the chassis’ edges are highlighted by the soft glow of a backlit keyboard when the laptop is open. The UX550 is professional but not stuffy, and effortlessly stylish with just the right amount of flash. No doubt about it, from a design perspective, this one great-looking laptop. But it’s even more impressive when you consider what’s under the hood. Powering the whole show is Intel’s latest Core i-series quad-core CPU (up to the Core i7) based on the Kaby Lake architecture. That’s running alongside NVIDIA’s GeForce GTX 1050 Ti GPU, a powerful discrete graphics engine that packs 4GB of GDDR5 and more than enough muscle to carry you through work and play. The very same chip is used in our ROG Strix GL553 and GL753 gaming laptops. North American variants of the ZenBook Pro can be configured with up to 512GB of storage on a PCIe x4 SSD, so transfer speeds won’t hold you back. And, with up to 16GB of RAM, multitasking will be a breeze. Whether your day involves class and gaming in your downtime or editing multiple layers of 4K video over the span of several hours, the ZenBook Pro will be able to keep up just fine. Of course, with all that hardware in such a slim package, you’ve got to wonder about heat. Namely, is the ZenBook Pro going to run uncomfortably hot when you’re really putting the 1050 Ti through its paces? The Pro uses dual blowers and a triple-heat-pipe design to ensure adequate cooling for the laptop’s core during the most taxing activities. A happy byproduct of our efforts to keep the guts cool: the surface temperature is 2.35°C lower than that of the old ZenBook Pro UX501. A specially shaped battery fills as much of the available internal space as possible; the 73Wh battery can last up to 14 hours depending on your specific configuration and is equipped with fast-charging that will get you to 60% charge after just 49 minutes at the outlet. No more lugging your charger on every outing or nervously lurking by the outlet at your local coffee shop, hoping it’ll free up before your computer dies. You can leave your dongles at home while you’re at it. 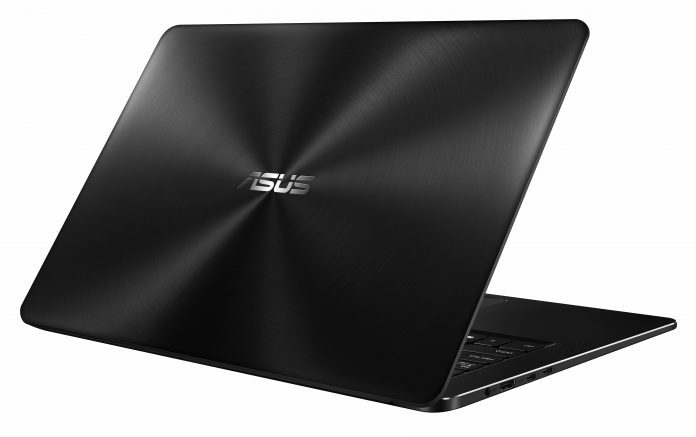 Though a lot of companies prioritize a slimmer build over connectivity (here’s looking at you, Apple), it’s a full house for the ZenBook Pro. Two USB 3.1 Type-C ports with Thunderbolt 3 offer support for dual 4K monitors when you’re at your desk. They sit alongside a full-sized HDMI port, two USB Type-A ports, a microSD slot for easily transferring all your media, and an audio combo jack. Of course, with all of that humming away beneath the surface, it’d be a waste not to go all out with a 4K UHD display. There’s an option for a FHD panel if you prefer to play your favorite games natively at 1080p, though. Both are touchscreens and support stylus input. They also feature our NanoEdge narrow bezels, which allow us to fit a larger screen inside a smaller chassis. 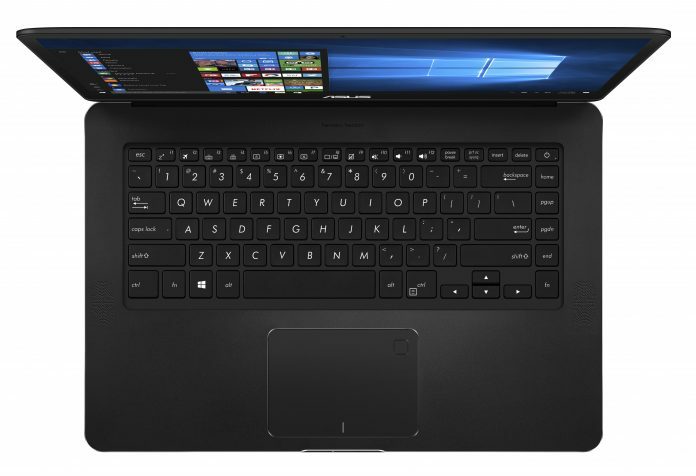 The ZenBook Pro’s 15.6″ panel sits snugly inside a 14.4″ x 9.9″ package. Easier to carry around, sure, but it also means you’re looking at a whole lot less bezel while you work—a mere 7.8 mm to the left and right of the screen. The display covers 100% of the sRGB color gamut and tops out at 350 nits of brightness. Its wide 178° viewing angles mean you can show off what you’re working on without having to change seats or scooch over so your buddy to take a gander without seeing color shift. Rounding out the UX550 is the sound system, which comes by way of a collaboration with the fine folks at Harman Kardon. You might not see the speakers, but you’ll definitely hear them. Four are distributed on either side of the keyboard and in the palm rests, with two each for high- and low-frequency sound. They work in tandem with a smart amp to pump out volume that’s 2.5 times louder with minimal distortion. With game-ready performance, touchscreen input, an ultra-portable chassis, and a battery life that promises independence for outlet squatters everywhere, the ZenBook Pro UX550 is a professional laptop built to fit your entire life, not just your day job. 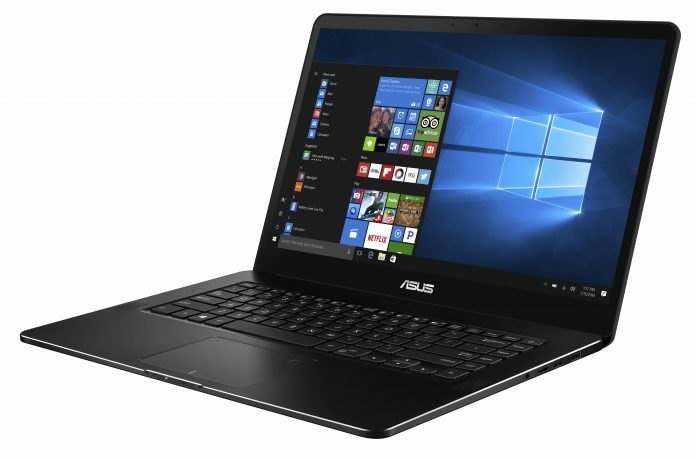 The ZenBook Pro UX550 was announced at Computex 2017 and will be available later this summer.